Micron's stock is at a critical juncture. While it has recovered by nearly 30 percent since the chipmaker reported a disappointing quarter in December, experts say Micron's fate hinges on its after-the-bell earnings report Wednesday. 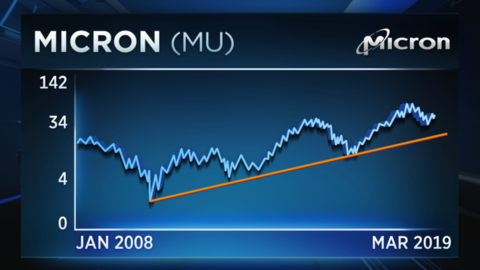 "If we look at the history of Micron ... from the 2009 low, we have three distinct declines, each one roughly 70 percent," Todd Gordon, founder of TradingAnalysis.com, told CNBC's "Trading Nation" ahead of the report. "Thus far, we've only done about a 55 percent decline, so if history is any guide, perhaps we have another 15 percent to go on the downside," Gordon said of Micron's most recent dip. "I'm wondering, if the numbers are weak tonight, could we go down and test that weekly level?" Gordon said that effect seemed "very" possible going into the report, noting how close Micron's stock currently is to hitting that weekly trend line. If Micron's quarterly results disappoint again, they could send the chipmaker's stock "down into the $40 range or even lower," he said. "So, if there's weakness, I'll be looking to short Micron in a very confusing semiconductor space." Michael Bapis, managing director of Vios Advisors at Rockefeller Capital Management, said he was also "super focused" on Micron's earnings, but maintained a constructive view on the company's longer-term prospects. "We are in a technological revolution that's going to continue, so someone in that space is going to get it right," Bapis said in the same "Trading Nation" interview. "If [the report is] even close to being OK and people shake off the bad news from last December, I think you can go long the stock," he said. "It's trading closer to its 52-week low than the high, and … there's still demand in the space. It's just a matter of managing the company right, and this earnings release tonight will really help us understand where they're going." Micron's stock hovered around the $40 level for most of Wednesday's trading session and closed down less than 1 percent at $40.13. Shares of the $45 billion company are up more than 26 percent year to date. Disclosure: Vios Advisors at Rockefeller Capital Management owns shares of Micron.